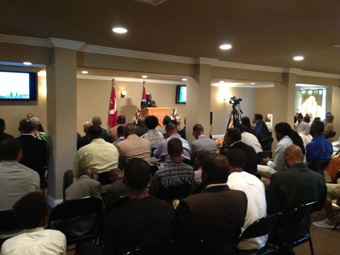 Rashad Muhammad speaks at Muhammad Mosque No. 46 in New Orleans, L.A.
Bro. Rashad, who is 49, became a registered member of the N.O.I. in Chicago at the age of 19. He has crisscrossed the country and the globe with Minister Farrakhan for the past 28 years; witnessing the love of the respected leader in countless public and private settings. “One thing I like that you all do at the mosque that we don’t do in the church is you all go after and pay attention to youth, particularly the young men. And then you all make them into responsible men. I love that,” she said. 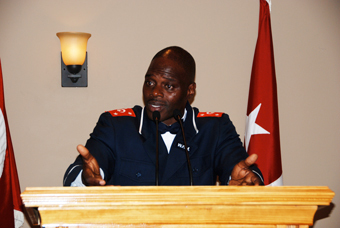 “I enjoyed the testimony of how he travels with Louis Farrakhan and his firsthand experience. It was a very comforting message,” added Artesia Mashia. “The Minister has a witness in Bro. Rashad. His credibility is unimpeachable, his experience unassailable,” tweeted Student Minister Jamil Muhammad of Baltimore. “Don’t be shy about asking questions,” are the words Bro. Rashad spoke during a special afternoon meeting for Believers. “I have a duty to the Believers to come and share with you all what Allah has blessed me with as it relates to the Minister’s service. His life has been a life of service,” he said. Abdullah Muhammad, who presently serves as the student Prison Reform Minister, invited him to the mosque. After becoming a registered member, he was trained by then Supreme Captain Frank Muhammad (now Ali Muhammad) in security. “Security is not necessarily a physical reality; it’s based on a spiritual reality. Most people think that security is based on being big and bulky. But it’s also based on the principles of your ability to think,” said Bro. Rashad. He fielded questions about the Minister’s battles with the Jews, the late Libyan leader Col. Muammar Gadhafi, witnessing the Mother Wheel, Khallid Muhammad, the Minister’s near death experiences and major surgery, balancing the mission and family life, behind the scenes travel experiences, and more. “Brother Rashad came to the city determined to serve the Believers and testify of the love of the Honorable Louis Farrakhan. We believe he did just that and more. During this weekend I believe we only scratched the surface of what brother knows from his travels and experience with the Minister,” said Student Minister Willie Muhammad of New Orleans. “We know the Minister from what we read, see and listen to. I believe that many on the team know him from that standpoint as well, however, that view is deepened by their personal witness of the divinely guided life of the Honorable Minister Louis Farrakhan,” he added.